Love is something that should always be celebrated, and if you’re lucky enough to find the person you love and want to spend the rest of your life with them, you should be able to share the exciting news with everyone in your life. For the past six years, 43-year-old Christopher Landis has worked as a teacher and choir director at Hingham Middle School in Massachusetts. During that time, he has become known as a passionate and positive teacher and is beloved by all of his students. According to his students, his enthusiasm and passion for what he does are infectious. “He’s just like so nice. You always walk into his classroom and he’s always there with a positive attitude and maybe a compliment. He’s just so nice,” Summer Foraste, one of Landis’ students, said in a statement reported by The Daily Mail. In addition, Landis tries to make sure his classroom is a safe space for all his students. As a result, his students trust him enough to tell him when something big happens in their lives. So when Landis got engaged on Christmas Eve in 2016, he wanted to tell his students about the exciting news. Landis had never told his students that he was in a relationship with a man. He always referred to his fiance, Joe Michienzie, as his “friend” whenever students asked. Landis wasn’t sure how his students or their parents would take the news. He feared that if he was honest with his students they might not approve of his lifestyle or worse, they wouldn’t be comfortable around him anymore. Landis kept his wedding plans with Michienzie pretty close to the chest as a result. Despite his secrecy, however, several parents from the school found out that Landis and his fiance were getting married in late 2018. They were happy for him and wanted to show theirs and their children’s support. So they planned with his fiance to give Landis a surprise. So for the following months, Landis kept everything a secret as he began planning his wedding with Michienzie. Despite his secrecy, however, several parents from the school found out that Landis and his fiance were getting married in late 2018. “At the end of the summer, Margit and I heard he was getting married. He’s the best teacher, and he’s got this great energy, and he makes every school function fun. We thought, wouldn’t it be awesome to do something for his wedding?” Joy Foraste, whose daughter is one of Landis’ students, told The New York Times. Foraste and fellow parent Margit Foley started brainstorming ideas for a surprise in September of 2018. But before starting any real plans, they decided to reach out to Michienzie to check that it was something that Landis would like and would be welcome at their celebrations. The choir parents had worked together to arrange so that their sixth-, seventh-, and eighth-graders could come and give a surprise at Landis’ wedding. As soon as they appear, Landis and his fiance are overcome with emotion. The children walk in, line up, and begin singing a familiar Beatles’ tune. Foley and Foraste went to the venue where the reception was going to be held and cemented their plan to have the kids perform a special song for the occasion. They then contacted Dona Maher, a private chorus teacher whose students are often in Landis’ class. With Maher on board, the students showed up at The James Library in Norwell every Sunday for four weeks to practice their performance. Not only were all the kids dedicated to perfecting the performance, but they also managed to keep it a secret the entire time. The kids had practiced every Sunday for more than four weeks in order to surprise their teacher. They dedicated themselves to both perfecting the performance and keeping it a secret. This was not an easy task as there were 50 of them. As soon as the refrain begins, it’s obvious that all Landis and his fiance really need is Love. “Then I saw the first student come in and I was like ‘Oh my goodness,’ but I don’t think it hit me until all of these students came in and they were smiling and all dressed up. 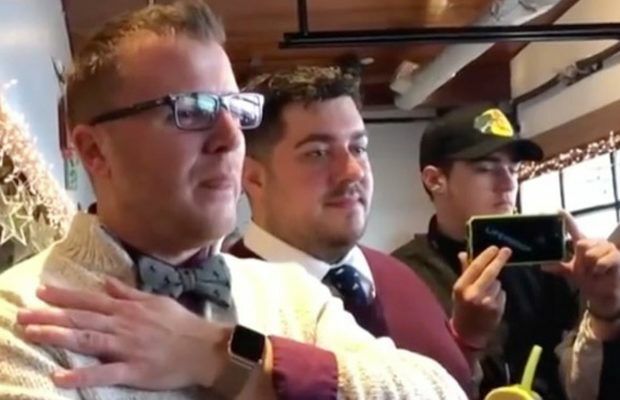 Then I started crying and they started crying,” Landis said about the touching moment, which was filmed and quickly went viral after being shared on social media.